The recently launched Suzuki Burgman 125 maxi-scooter has gotten off to a flying start in the Indian market, what with the scooter clocking 11,000 units in just 12 days of launch. This is a very impressive start for what could be a segment changing automatic scooter for the Indian market. 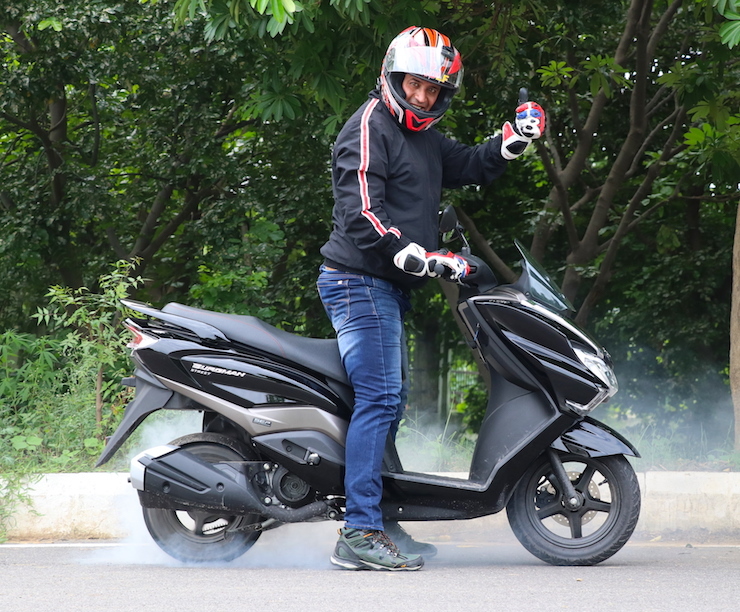 One-of-its-kind, the Burgman 125 is the largest scooter sold in India, and is aimed at buyers seeking something more than just a commuting machine. In fact, the Suzuki Burgman 125’s dimensions are aimed at longer distance riding, something that other automatic scooters in India have not been designed for. The Burgman 125 is the smallest engined scooter in Suzuki’s global range of maxi-scooters, some of which have engine capacities in excess of 600cc. The scooter shares its 125cc, air and fan cooled single cylinder engine with the Suzuki Access 125. This engine puts out 8.5 Bhp of peak power and 10.2 Nm of peak torque. Although these figures aren’t ground shaking, they are perky enough to give the Burgman 125 rapid acceleration for everyday use, and sustain speeds of over 80 Kph for an extended period of time. The Burgman 125 is priced at Rs. 68,000 ex-showroom, Delhi, which makes it Suzuki’s most expensive scooter in India. In fact, the Suzuki Burgman 125 is a lot pricier than most other 125cc scooters sold in India save for the Piaggio Vespas. For the premium that Suzuki is charging for the maxi-scooter, a lot of interesting features are on offer. For starters, there are the LED headlamp and tail lamp, a front windscreen, a digital instrument cluster with a digital clock, oil change indicator and a dual trip meter, a multi-function keyhole that also gets a fuel-lid release, DC power socket for charging mobile devices and 21.5 litres of underseat storage. Telescopic front forks and a monoshock rear make for suspension and the scooter gets a front disc brake and a rear drum brake. Combi-braking is standard.